As I was cycling home in the pouring rain the other day, it struck me that the car is as dangerous an idea as it is a physical object. The reasons that people consider the car to be so successful are the very same reasons why the car is so problematic; they are isolating, they promote a (false) sense of security, they have the appearance of convenience and they are desirable. Or at least that is what people believe. Why do people believe these things? In large part, I presume that an endless, expensive and all-pervading campaign of marketing and advertising has done its job. I also presume that like most new technologies, the motor car had to survive the early knocks and the battle to “define” what this new technology was (when they first arrived on the street, they were considered “death machines”, driven by “road hogs” and “speed maniacs”). The question is probably not even relevant for recent generations, who have not had to make the paradigm shift that allowed the car into our lives – it was already there. So how did it do it in the first place? And, the question that really intrigues me - What subtle shifts in society and thinking allowed us to hand over huge swathes of public space to an essentially private pursuit? From an urban planning point of view, the founding in 1929 of a small town called Radburn located within Fair Lawn, New Jersey may have been a turning point. It was conceived as a “Town for the Motor Age” and was designed on the basis of almost complete separation of different modes of transportation. As the motor car gathered in popularity after the turn of the century with large scale manufacturers like Ford leading the way, calls for motorists to be separated from the suddenly slower and more vulnerable street-users became ever stronger. This “separation” was to be achieved by simply removing the vulnerable from the streets, which was a pragmatic and understandable approach to problems like the staggering numbers of children being killed by motor cars whilst playing. At Radburn, here was the urban manifestation of this process for all to see – and just as importantly for others to be influenced by. The spaces that were previously the “streets” for all and sundry to use by collaboration and compromise became the “roads” for motor cars only. Pedestrians and cyclists were given their own alternative spaces and routes. Great, you may cry – exactly the model of segregation we want! The problem is that by handing over this road space to cars, particularly in urban situations, and allowing the transportation system to become dictated by the needs of one particular mode, we have also given away our civic space. The road is for cars and that is that. In order to now re-engineer that same road space to create the segregation and cycling infrastructure we so desire, we have to overcome the idea that the space somehow “belongs” to the motor car. Possession is, as the old saying goes, nine-tenths of the law. The trick that was pulled off by “motordom” in the 20’s is the same trick needed now and it is going to be a very hard sell. But, it happened before and it has happened again, not only in the famous cycling nations of Holland and Denmark, but seemingly unlikely places such as Paris and Barcelona. Never underestimate the power of ideas. As a newcomer to the world of cycling, I am intrigued by the arguments and ideological camps that have become established over the years. Whilst I don’t necessarily understand the history, I do understand the motivation of many cycling campaigners who long for the promised revolution in mass cycling that seems to be always around the corner in this country. The benefits are clear and have been ably described in detail in many other places. However, the revolution seems to be a long time coming. A needs to be joined to B in the most direct way. There seems to me to be only one way of achieving this; by segregating cycle traffic from motorised vehicles. For me, this is the clear lesson from looking at the places where the cycling revolution is a reality; Denmark and Holland. "Under our - and most - constitutions, all people are equal under the law. Therefore, a bus with 100 passengers has 100 x the right to access and space as a single occupancy car. Likewise, a child on a tricycle has the same rights as a motorist. This is not about being anti-car, this is about equality for all." are the “killer apps” as far as I can see. The city of Gaungzhou which already has a modal share around 10% (something only dreamt of here). A city with excellent separated infrastructure already in place. A city in a country with a natural affinity and recent history of mass bicycle use. And yet even they see the urgent need to upgrade, reinforce and re-design the infrastructure they already have just to maintain the level of cycle use, before exploring all possible ways of increasing it. They are not proposing to train people or provide them with personalised travel planning – they are building safe, separated routes for bikes so people can move from A to B without fuss. Simple really. In Copenhagen, Copenhagenize reports that “Whenever the City builds new bicycle infrastructure on a stretch of road there is an increase of 20% in the number of cyclists and 10% fewer cars. "We don't need great architectural monuments to make a city a nice place to live, just make the public spaces nicer "
A much better conclusion than the one I wrote to the piece below, courtesy of Jan Gehl speaking at "Making Tomorrow's Liveable Cities: Urban Planning in a Cold Climate" yesterday. Cardiff has had its own little urban renaissance lately courtesy, bizarrely you may think, of the new St David’s 2 retail development. Although this huge behemoth of an internal shopping mall may well be one of the last of its kind in the UK (it already feels outdated when compared with open street-type developments like Liverpool 1 and Cabot Circus in Bristol), it has provided at least one welcome benefit – an abrupt and discernable “raising of the bar” in terms of what Cardiffians experience as quality urban realm. The upgrade of the Hayes from the new Central Library to Queen Street is a bold, minimal and stylish intervention and deserves praise for the quality of materials, workmanship and layout. It seems that the design aspirations have been matched by the outcome and that rare combination should be recognised with appropriate praise. The danger of course was that other parts of Cardiff would start to look decidedly tatty in comparison. However, it has been interesting to see just how far the Section 106 (as I presume that is where the bulk of funding has come from) money has stretched, with sections of Charles Street and Park Place having subtle facelifts too, not to mention upgrades around Churchill Way and along Bute Terrace. Of course, these improvements were always going to leave Queen Street as a visual problem – the busy floor layout and excessive clutter now looks very clumsy and provincial compared with the Hayes – but this work was carried out relatively recently, so I suppose we are stuck with it and its surface that becomes unexpectedly slippery in the gentle drizzle that occasionally falls here. So, the unfortunate legacy of Queen Street aside, the bar has been raised and the patient citizens of Cardiff have had their eyes opened a little wider to the possibilities of strong urban design. You would have hoped therefore that the Council might have sensed the zeitgeist and taken advantage of the newly enhanced aesthetic sensibilities of its population. Tragically however, a once in a generation opportunity has been well and truly squandered with a dreadful intervention in the High Street. There are clearly many technical and economic constraints - this was obviously not going to be a straightforward pedestrianisation exercise. So why then go for the trendy idea of shared surface, only to have to compromise under the inevitable (and genuine) criticism of the local disabled user group? The white line delineating a central carriageway is horrible and spoils what is otherwise a very reasonable and high quality choice of materials. But the real icing on the cake is all the “stuff” above ground. 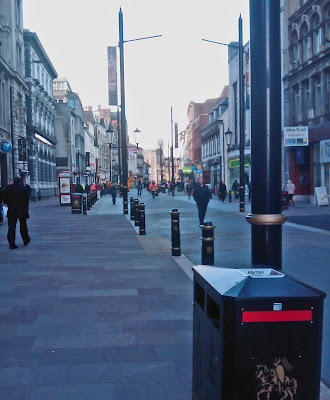 For instance, one wonders how much of St Mary Street could have been similarly improved, if the money spent on several hundred cast iron bollards now gracing the view (and without discernable purpose) had been saved. Our eyes have become so accustomed to this sort of visual mess in our urban spaces that it actually takes an effort of will to see it. What level of processing power must our brains have to devote to filtering out this chaos? Our brains constantly undertake real-time special effects wizadry worthy of a Hollywood blockbuster. But once you’ve seen it, the trick is lost and you suddenly can’t ignore it - it becomes all the more real; bollards, lampposts (just horrible) signs etc…indeed you can barely see the Castle through it all. Did the designers not see the restraint in the design of the Hayes? Were they deaf to the voice of Mies imploring “less is more”? The council want to persuade us that Cardiff aspires to be a European Capital City of world stature. Clearly, that is ridiculous and a distraction - it doesn’t need to be. It is perfectly suited to being a small scale regional administrative centre; it is compact, green and with friendly and welcoming people. But those people deserve urban quality as fine as anywhere else; after all, the cat is out of the bag now and we’ve all seen how it can be done in the Hayes. You don’t get many goes at a redesign of a street in a place like this. That is the real tragedy. 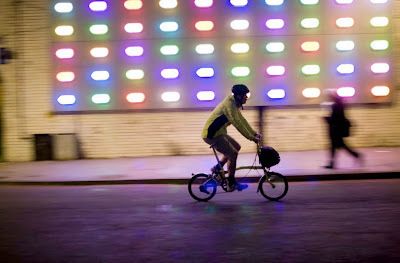 http://www.welwynmachineworks.blogspot.com/ has pointed me in the direction of a new architectural competition organised by the Architecture Foundation.It is for an innovative and portable modular bike storage facility, which also needs to act as a signpost or branding opportunity. 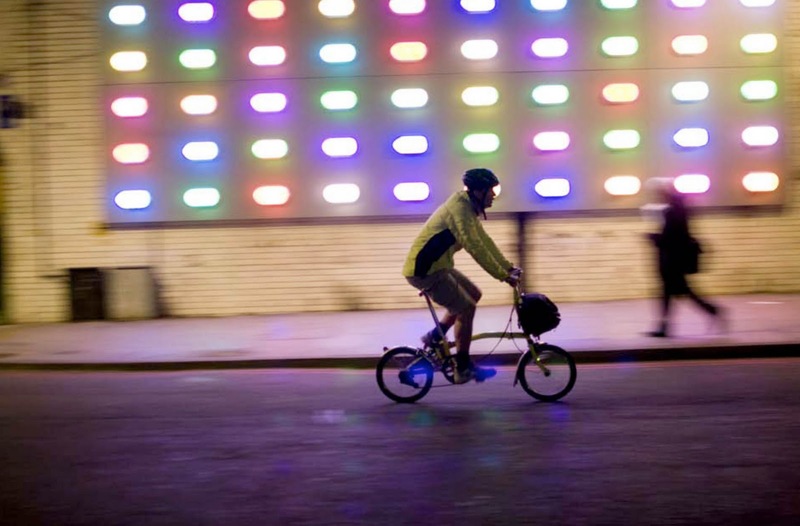 The details/brief are at http://www.architecturefoundation.org.uk/assets/files/Competitions/Bankside%20BikeShed/Bankside%20BikeShed%20Brief.pdf and we are tempted to give it a whirl. If there are any ideas on what the ideal bike storage should include, feel free to let us know. We are thinking this is an ideal way of introducing some ideas from Holland and Denmark, where this sort of thing is not exactly thought of as cutting edge, to the UK - where it is. Give him a real wave if you see him!